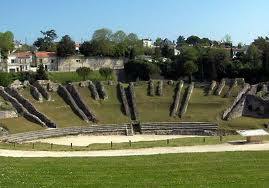 Th e town of Sainte, 15 minutes from Cognac, is home to another great Roman amphitheatre. At the end of the Via Agrippa, an ancient road from Lyon in eastern France, Sainte is the capital of the Charente Maritime. Similar to Cognac in size it has much to discover but the theatre is the star turn.